Celluma Advanced Light Therapy is a non-surgical method of skin treatment that can heal acne, reduce wrinkles, and promote wound healing. This is an excellent method for patients who want to address their skin issues without surgery or medication. The type of light used depends on the condition being treated. These three types of light have different capabilities when it comes to penetrating the upper and lower layers of the skin and triggering the cell reactions that are necessary to see results. 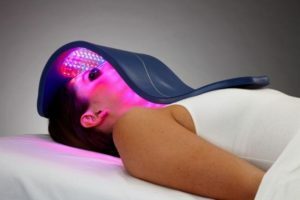 The acne treatment uses blue light, which penetrates through the epidermis and into the dermis. When the blue light enters the skin cells, it causes them to produce singlet oxygen. Singlet oxygen will actually cause the acne bacteria to self-destruct. Patients who receive Celluma Advanced Light Therapy for acne see significant improvement after receiving twice-weekly treatments for a period of eight weeks. No oral or topical medications are required to see the effects. Wrinkle treatment with Celluma Advanced Light Therapy uses red light, which penetrates all the way through the dermis. The photons produced by red light are absorbed by fibroblasts, cells in the skin that produce collagen and elastin. The photons will stimulate the production of more collagen and elastin, making the skin smoother and firmer. Celluma Advanced Light Therapy can also be used to heal wounds like bruises. 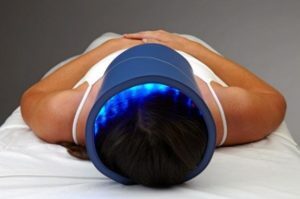 This treatment uses red and IR lights. IR light penetrates all the way through the dermis and into the subcutaneous tissue. Red and IR light trigger angiogenesis, the formation of new blood vessels. This enables wounds to heal more quickly because there are more vessels carrying oxygen-rich blood to the wounded area. This same process helps to alleviate pain. Pain treatment uses only IR light, which stimulates angiogenesis. This leads to a reduction in inflammation, which reduces pain. If you want a non-invasive, simple and easy method of treating any of the above conditions, call today to find out more about Celluma Advanced Light Therapy in our esthetics treatment room.